In print, online, or on your mobile device, Principles and Practice of Pediatric Infectious Disease provides the comprehensive and actionable coverage you need to understand, diagnose, and manage the ever-changing, high-risk clinical problems caused by pediatric infectious diseases. With new chapters, expanded and updated coverage, and increased worldwide perspectives, this authoritative medical reference offers the latest need-to-know information in an easily-accessible, high-yield format for quick answers and fast, effective intervention! Spend less time searching thanks to a consistent, easily-accessible format featuring revised high-yield information boxes, highlighted key points, and an abundance of detailed illustrations and at-a-glance tables. Be prepared for the unexpected! A veritable "who's who" of global authorities provides practical knowledge to effectively diagnose and manage almost any infectious disease you may encounter. Quickly look up the answers you need by clinical presentation, pathogen, or type of host. Get expanded coverage for all types of infectious diseases including new chapters on infection related to pets and exotic animals, and tickborne infections. Apply the latest recommendations and treatments for emerging and re-emerging diseases including the H1N1 virus. Access information on the go from your laptop or mobile device via www.expertconsult.com, featuring a downloadable image gallery, fully searchable text, and links to PubMed. Battle the leading cause of death in children with the high-yield Principles and Practice of Pediatric Infectious Disease. 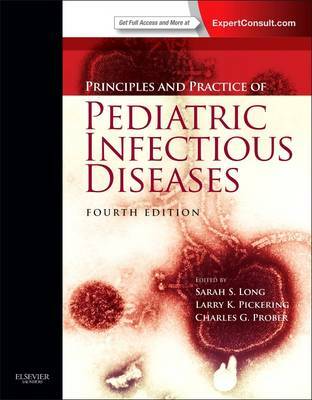 "This book provides up-to-date information on infectious disease in children. The chapters are written by experts in the field who impart the information required to treat these patients. When used in conjunction with a patient's history, physical, and clinical picture, this book will aid in the diagnostic process." - Renuga Vivekanandan, MD(Creighton University Medical Center) Doody 4 stars!